It’s time we had this discussion. Winter. Or as people from other states would call it, “winter”. Look, I get it. When you have our great temperatures all year round, any temperature drops are ones you feel. It is all about perspective. And as we approach the Ekka Winds season, it’s going to stay this way for at least another month. But, please decide for yourself if it’s cold!! This Saturday morning just gone was supposed to be the coldest morning in six years, with temperatures from 3 degrees. Yeah…that is cold. Near freezing is cold. Problem is, it wasn’t that cold. I had seen some pretty mist last week on my way to work, so I decided to try and trust the weather reports and I got up early to go watch the sunrise and see if there was any mist. It has been colder heaps of times this winter! Sure, this is just subjective feeling. But how many people who tweeted about the cold weather had actually gotten out of bed at that time? My train station is heaps colder than Saturday morning was. It’s in one of those weird pockets of cold that exist in some streets. I’m a little weird, and like getting up early. Years of a round trip commute of nearly 3 hours every day have probably brain damaged me or something. Anyway, I got up early Sunday too. And now, Sunday was COLD. There was wind. Which chilled it right down! Look, people, I know many Queenslanders will get upset with this. And other states will laugh at the thought of Queenslanders being upset at this. And yes, it gets cold in some parts of Queensland. I’ve been out west in winter. It’s cold. But let’s just keep realism involved in our weather complaints, ok? Link Up a funny post below! Old or new, we love everyone who links up! I am sick of being cold and when it’s summer, I’ll whinge that I’m sick of being hot. I really don’t like either extreme. I wish I could live in different states for different seasons. Queensland in Winter, Tassie in Summer and anywhere else in between. I hate the humidity in summer. Yet I would miss the tropical storms so much if I lived somewhere else! There’s no such thing as winter here on the Gold Coast which is why I love it so much! Haha true, even being those 100ish kms south of me makes a difference! Wait, that makes no sense. South gets colder…wow. Note to self, don’t reply to comments when tired. Anything under 10 degrees celsius is officially freezing. Just because I say it is. LOL. 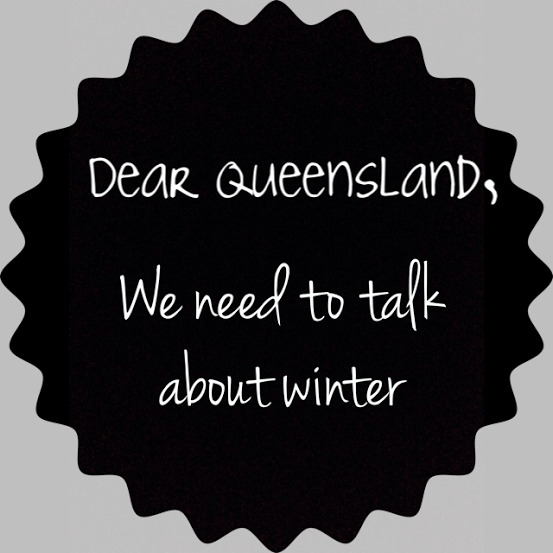 I like Queensland winters just the way they are – 1 or 2 days every year is just fine by me. A few days of chill just to be thankful about summer!